A holiday in the country became work for three RSPCA officers after they found a bird trapped in a drainpipe. 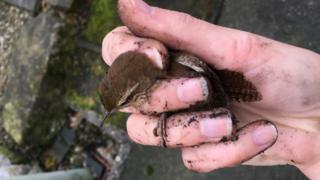 The trio from Yorkshire discovered the trapped wren at their holiday cottage near Brampton, Cumbria. They were alerted by the "scuffling" sound of the wren as they headed out on a walk. The RSPCA said the officers were "huge animal lovers" who "could never turn their backs on an animal in need". Jilly Dickinson and Lucy Green from North Yorkshire and Kris Walker from West Yorkshire were on a five-day break near Brampton. Ms Dickinson said they knew something was not right when they heard the noises and "followed their gut instinct". "[The bird] was obviously very frightened and distressed as he kept trying to jump back up the pipe but Lucy managed to get hold of him so we could manoeuvre him and get him out," she said. "He was a bit dazed and battered but, thankfully, didn't appear to have any serious injuries. "We released him there and then and watched him hop around for a bit and hide beneath some chairs before he flew off."